Wow.just wow. Great work by Varsha. just as I dreamed. Her patience, dedication and talent is matachable. 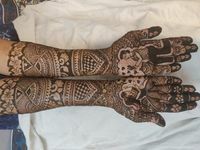 Best mehendi art work with designs of your choice. I loved the color and how beautiful the mehendi looked on my wedding day. Thankyou Varsha :) Keep doing the great work. Get best quote from Jisha Mehendi Art and book your date! Check their prices and availability. Send enquiry to your selected list of Bridal Mehendi at WedMeGood and choose the best. Browse for more Bridal Mehendi in Goa and more wedding vendors at WedMeGood and plan your wedding hassle free.